If there's one thing we love the most, it's brands that were created with a meaning. With all of the fast fashion/mass production stores that exist today, we've grown to really value the ones we can relate to on a personal and inspirational level. One of our favorites is an accessories line based out of LA with some of most unique designs you'll find anywhere. The story of how this brand came to be what it is today is one worth telling, as the designer, raised by a traditional Persian family, chose to take the route less traveled by women of her culture and become an entrepreneur. I decided to break with my culture and follow my heart into a field I was internally drawn to.... design. The more I designed shoes, jewelry and other products, the more it felt like the right thing for me to be doing. So now I believe that design is part of what I was designed to do. With no experience in design and no formal training, Melody Ehsani started her brand in 2008 with the power of her creativity and hustler's ambition to guide her. It wasn't long before Melody Ehsani's designs became recognized and desired by stylists for their photo shoots, which in turn allowed her to develop relationships with celebrities to create custom pieces. Artists such as Erykah Badu, Beyonce, and Nicki Minaj (plus a lot more) have been down with the Melody Ehsani brand for years which reflects it's strong presence in the culture of hip-hop. Fashion goes hand in hand with music today and it's an amazing thing for an independent designer to be able to develop a good reputation in such an influential industry. This year, Melody Ehsani made history by becoming the first female to collaborate with Reebok to design a pair of PUMP sneakers. With undeniable success, the sneakers sold out globally within hours and landed her a deal to create more exclusive sneakers with Reebok in the future. 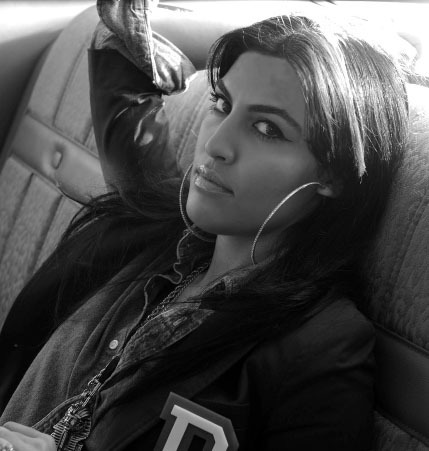 More than just a cool designer, Melody Ehsani is a driven business owner. She's been responsible for the managing the operations of the business such as sourcing, meeting with manufacturers and handling the technical side of things as well as the creative. It takes drive, a lot of hard work and strategic decision making to run a business and she's been doing so successfully for years. Melody Ehsani aims to empower women through her designs and you can notice it through every aspect of her brand. From the subtle statements engraved on the side of rings to the custom tape that's wrapped around the packages ordered from the e-commerce site, customers experience true satisfaction from their Melody Ehsani purchases; retail therapy at it's finest. I want the women who wear my pieces to have the same opportunity for equality, wholeness, and self expression. My style is inspired by paradox, controversy, justice and pushing the envelope. A portion from each M.E. item purchased will go towards the advancement and education of women in our society. The shop offers a variety of jewelry (+ custom made pieces), apparel and shoes. The most recent designs Melody Ehsani embody the personas of ancient Egyptian queens like Cleopatra and Nefertiti along with the modern day, trendsetting young woman (us!). To shop and see more of what the Melody Ehsani brand is about, visit melodyehsani.com.